Plastic gear first emerged into large-scale use in the 1950s and soon became economical and functional alternatives to metal gears. Plastic gears are made of inexpensive commodity plastics for use in low power drives in products like clocks, motorized toys and lawn sprinklers. Plastic gears have greater consistency and are easily molded to various shapes. They are less expensive and are lighter in weight. 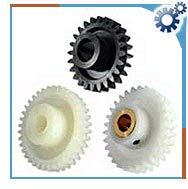 Plastic gear is chemical and corrosion resistant and have quieter and smoother operation. They deflect to compensate for inaccuracies by absorbing tiny impacts of small tooth errors and gear misalignment. They offer more efficient drive geometry. Plastic gear ratios are feasible to allow for wider gears that transfer more power in single stage, thereby increasing load capacity. The dimension and properties of plastic gears change with temperature, moisture absorption and chemical exposure. The plastic material can withstand high tangential force with acceptable tooth deflection. They have high strength to withstand shock loads during sudden stops and overloads. They are creep resistant and maintain contact ratio, tip clearance and overall gear geometry. The most common plastic materials used for making gears are acetal, polybutylene terepthalate (PBT), nylon, polyphenylene sulfide (PPS), and liquid crystal polymer (LCP). Acetal is the most important of all plastics. It offers long term dimensional stability and excellent lubricity. It is often used in gears for office equipment, irrigation equipment, autos, appliances, clocks and meters. PBT produces extremely smooth surfaces in molding and is often used in housing. Nylon offers toughness and wears well against other plastics. They are often used in worm gears and housings. PPS offers high stiffness, dimensional stability and extended fatigue life. LPC works well in small, precision gears under light loads, such as watch gears. Plastic gears have some disadvantages also. They have reduced ability to operate at higher temperatures and can be effected negatively by many chemicals. They are often used in water meters, showerheads, water sprinklers and other applications where water could erode metals.